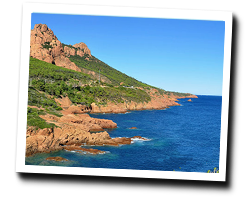 The Corniche de l'Esterel, also called "Corniche d'Or", is famous for its beauty. Red porphyry rocks plunge into the blue of the Mediterranean Sea and compose breathtaking scenery, among the most beautiful on the Mediterranean coastline. At the seaside you can find sandy beaches, pebbly coves and charming marinas. On the Corniche de l’Esterel enjoy a seaview holiday rental. Nice studio flat with alcove and Terrace, beautiful view of Cannes bay and Esterel. In a residence located on beach , no road to cross; parking, garage; tel +internet, air conditioning, TV. 50 m from shops . 1 Bedroom(s), 2 double bed(s). Final cleaning : 45 €. 3 rooms apartment 55 m2 in a residence. Balcony with outdoor furniture, deck chairs and barbecue. Shared outdoor swimming pool. View of the rocky coast. Located in Théoule-sur-Mer, Nirvana Loft is a beachfront apartment. Guests can enjoy a furnished terrace with sea views. The property is a 6-minute drive from Old course Golf Course, and 10 km from Cannes. 2 rooms apartment for 4 pers in Théoule sur mer, sandy beach at 50m, swimming pool, Terrace and private car park. 50m from the beach and restaurants. south facing Terrace 18sq. m with barbecue. panoramic sea view, view of bay, Estérel Corniche and Figueirette marina. 1 Bedroom(s), 2 double bed(s). Final cleaning : included. Price from 595 € to 1050 €. 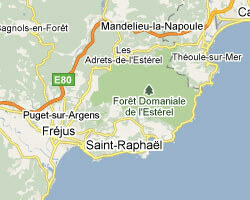 Villa Rock, ideally located in the estate of Théoule-sur-Mer, will ensure you a dreamlike stay. Completely open onto the Bay of Cannes and the Lérins Islands, its splendid decoration and its complete fittings, will delight you. 5 Bedroom(s), 5 double bed(s). short stays possibility. Final cleaning possibility. In a prestigious and secure domain Theoule-sur-Mer with private access to the sea, this recently renovated contemporary villa enjoys a panoramic view of the sea, the Lerins Islands and the Cap d'Antibes. It faces south and is surrounded by a landscaped garden of 2600 m2. 3 Bedroom(s), 2 double bed(s). short stays possibility. Final cleaning : 240 €. Wonderful 2 bedroom modern apartment with unique view of the sea and a large 39 m2 large terrace. 2 rooms apartment 35 m2 in the residence "Baie de la Méditerranée". Balcony, garden with outdoor furniture. Shared outdoor swimming pool. View of the sea and the port.